There are some steep inclines to traverse at Mission Peak in Fremont, CA. Make sure you go early and bring a lot of water if you wish to tackle this mountain! You get to see a good amount of wildlife here and also hear the cacophonous mooing of the cows hidden behind trees. Where are they?!? At some point, we will find them! I haven't tackled any mountains yet. It's something I definitely plan on doing one day. It would certainly make for a nice change of pace from the hiking around here. 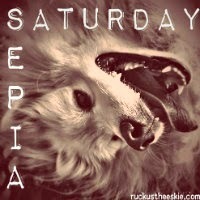 Looks like you had fun, have a happy Sepia Saturday! Wow Ruckus! You must have been working really hard to get to the top of the mountain!! Happy Sepia Saturday! That is an excellent shot of you!! Sounds like a nice place to visit and a good way to stay fit. Have a super Saturday. Ruckus, I bet that hike was beautiful. Have a great weekend. Wildlife and cows hidden behind trees? Sounds like an interesting hike. Have a great weekend. Sounds like fun! I'll put on the places to go when Veruca and I make it out to the west coast. What a great Sepia shot!! Hope you are having a happy Sepia Saturday! It looks like a fun hike! We are impressed with your hiking skills!